On the left, Francesco Hayez, Ritratto di Teresa Manzoni Stampa Borri, 1847-1849, olio su tela (Pinacoteca di Brera). On the right, Jean-Auguste-Dominique Ingres, Ritratto di madame Gonse, 1852, olio su tela (Musée Ingres, Montauban). The stars of the seventh dialogue are a masterpiece from the Pinacoteca’s own collections entitled Portrait of Teresa Manzoni Stampa Borri by Francesco Hayez and three important guest works rarely shown in public, all of which illustrate different approaches to the interpretation of naturalism. The seventh dialogue, entitled “On Ingres and Hayez. 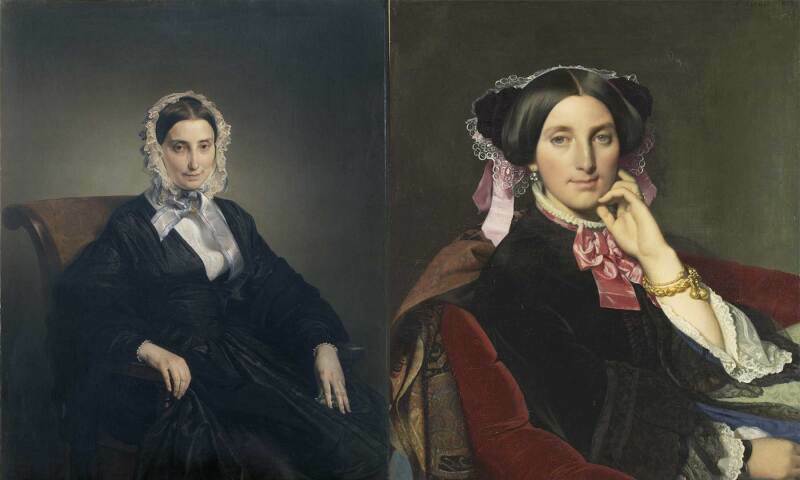 A different look at mid-19th century women”, showcases a masterpiece from the Pinacoteca’s own collection, Francesco Hayez’s Portrait of Teresa Manzoni Stampa Borri, interacting with three important guest works: Jean-Auguste-Dominique Ingres’s Portrait of Madame Gonse from the Musèe Ingres in Montauban, Francesco Hayez’s Portrait of Selene Taccioli Ruga and a plaster bust by Lorenzo Bartolini portraying Anna Maria Virginia Buoni Bartolini, the two latter works both from private collections.